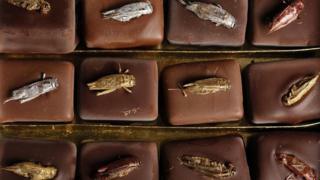 Eating insects: Would you be up for trying something like this? When you head to the supermarket, what's on your shopping list? Fruit, a packet of crisps, cereal and milk ? Probably not some insects for a tasty snack. It sounds like something straight out of I'm A Celebrity - but this week a major supermarket is starting to sell packets of edible bugs. Sainsbury's says it is the first British supermarket to stock packets of Eat Grub's smoky BBQ crunchy roasted crickets, which will be sold in 250 stores across the country. Eating insects isn't actually as unusual as you might think. More than 2 billion people around the world already eat them, and scientists say eating bugs could be the key to saving our environment. They believe insects could help fight world hunger and malnutrition because there are so many of them, they are healthy, and have less of a carbon footprint. Why are insects so good for us? Crickets, grasshoppers and mealworms contain more copper, zinc, magnesium and calcium than beef! But remember not all bugs and insects are edible! You should always check before you bite! Insects are filled with lots of good nutrients, including amino acids and protein. 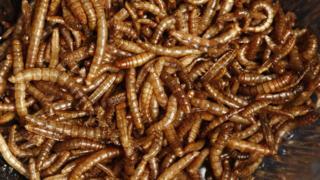 Crickets, grasshoppers, and mealworms contain more copper, zinc, magnesium and calcium than beef! There are a LOT of insects in the world. Some people put the number at 10,000,000,000,000,000,000... which is 10 quintillion! Agriculture produces a lot of greenhouse gases and farming insects doesn't require as much land and water as traditional agriculture does. Insect farming is already happening in Africa. Insects provide an opportunity for new ideas in business and the technology and scale of edible insect farming is improving. Insects can be eaten raw or processed into powders. Several new businesses in the Netherlands, South Africa and Kenya have been set up to focus on making insects for human food. Is eating insects the answer to global hunger?